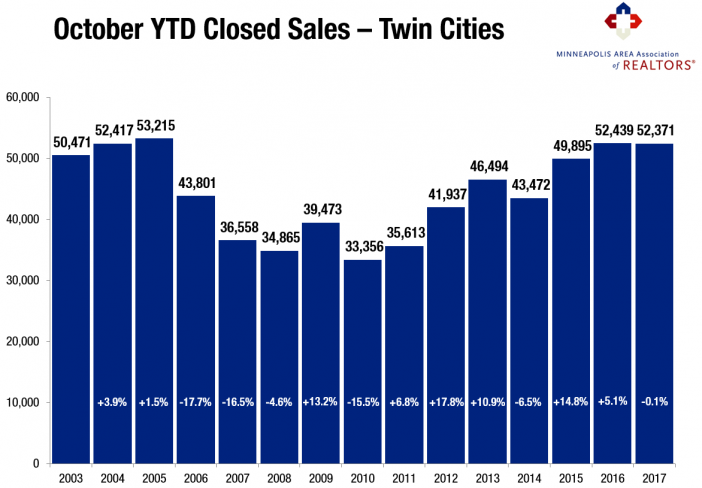 Minneapolis, Minnesota (November 15, 2017) – The Twin Cities housing market is holding steady after both sales and prices reached record highs this year. In October, new listings were up 3.1 percent compared to last October but are on-track for a 2.0 percent decline for the year. Pending sales rose 3.9 percent for the month but will likely be flat compared to all of 2016. Closed sales eked out a 0.3 percent October gain but are also likely to be flat for the year. The number of homes for sale decreased 18.0 percent to 11,221. Absorption rates contracted as well. Given strong demand and low supply, prices held their ground and marched higher. The median sales price rose 6.1 percent from last October to $244,000. This price metric will likely show a 6.5 percent annual increase. Home prices have now risen for the last 68 consecutive months or over 5.5 years. At 52 days on average compared to 61 last October, homes went under contract 14.8 percent faster. Sellers who list their properties are averaging 97.7 percent of their original list price, 0.8 percent higher than October 2016. The metro area has just 2.2 months of housing supply. Generally, five to six months of supply is considered a balanced market where neither buyers nor sellers have a clear advantage. Headline figures can often mask important details and specifics of which buyers and seller should be aware. For example, year-to-date, closed sales only fell for homes under $250,000. Sales activity increased for homes priced between $250,000 and $500,000, $500,000 and $1,000,000 and for properties over $1,000,000. Market times and the ratio of sales price to list price both improved for each of the above four price ranges. Traditional market activity continues to eclipse distressed activity. The economy and political climate affect housing. The national unemployment rate is 4.1 percent, though it’s 2.9 percent locally—the third lowest unemployment rate of any major metro area. A thriving and diverse economy has been conducive to housing recovery, as job and wage growth are key to new household formations and housing demand. The Minneapolis–St. Paul region has a resilient economy with a global reach, a talented workforce, top-notch schools, exposure to the growing technology and healthcare fields, and a quality of life that’s enabled one of the highest homeownership rates in the country. The average 30-year fixed mortgage rate has declined from 4.3 percent to 3.9 percent recently, still well below its long-term average of around 8.0 percent. One additional rate hike may be in the cards this year, but the Fed is focused on unwinding its large portfolio. Additional inventory is still needed in order to offset declining affordability brought on by higher prices and interest rates.